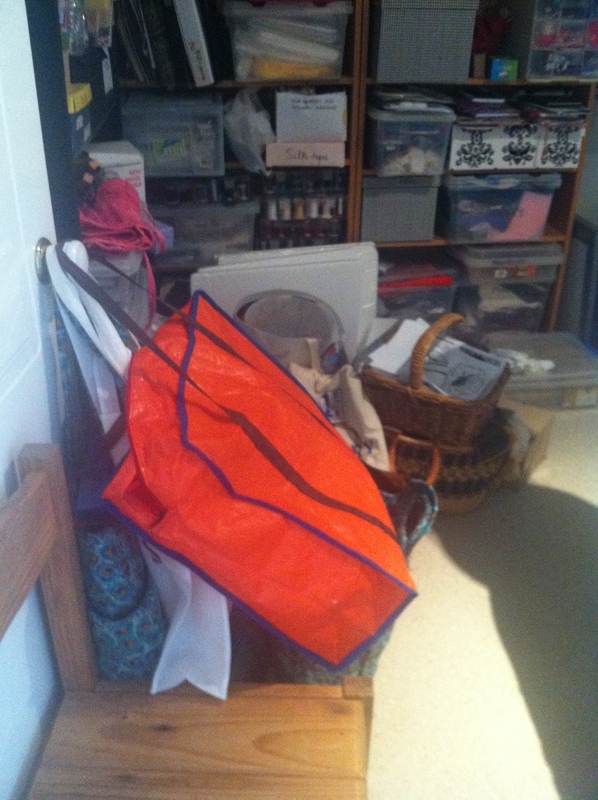 I really WAS going to clean out that sewing room. Honestly! I always take a “before” shot, just in case I ever actually clean it all up. It’s be a shame not to have the proof. 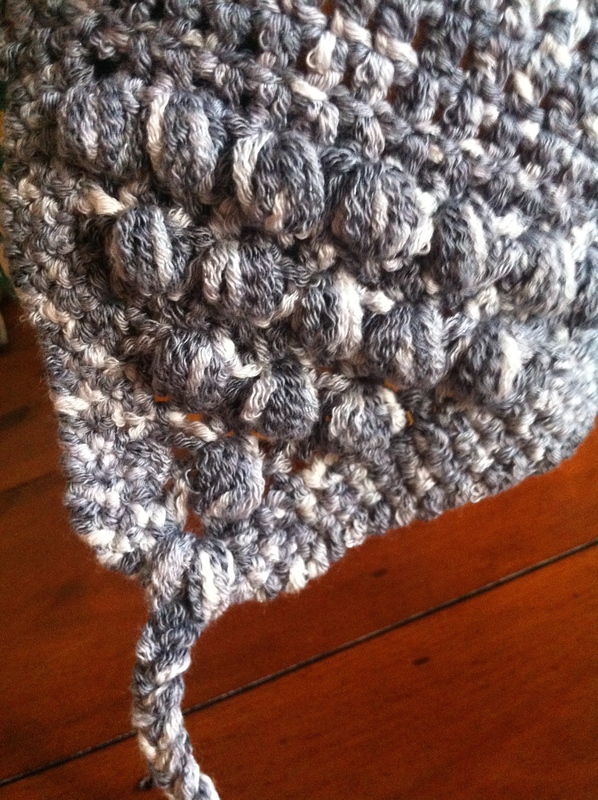 But then I found the half done crocheted hat. No pattern and not even a hook to give me any clues as to how to finish it. [Actually there never was a pattern but at least when I started it I’d had a good rummage through the internet and had a feeling for the shape and style I wanted]. Today it was definitely a bit hard to relate to. However, there was sun on the front porch while the sewing room looked very gloomy and, well, messy. So I decided to wing it. It’s very chunky yarn, 65% cotton and 35% PA. 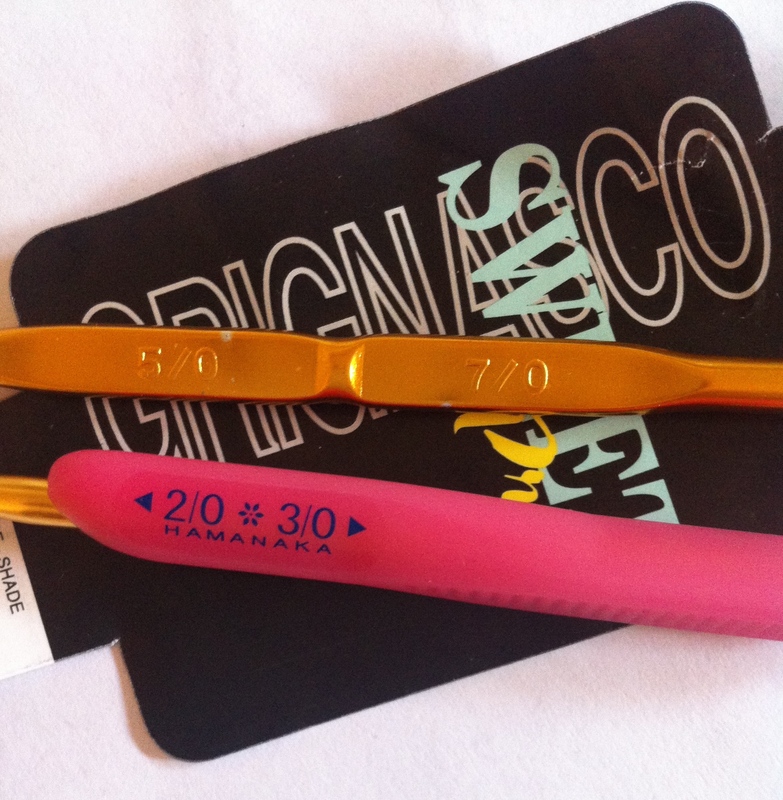 Brand is Grignasco Sweet Print and the recommended knitting needle size is a large 4-5 mm. The yarn label and the two (four) hooks I used. The floppy-looking bowl shape exiled to the plastic bag (the floppiness was no doubt why I’d not completed it before) looked as though it had been worked on a large hook. On experimentation it proved to have been a Tulip 7.0 or similar. I continued with this until I wanted to start tightening the band then switched for two rounds to the Tulip’s 5,0 end. After I’d worked the flaps I edged the whole thing with two rows of dc using the 3.0 end of another hook , finishing with a crab stitch edging in the 2.0 end. This last was hard as the yarn is not at all tightly spun and splits even with the theoretically “right” sized hook, let alone with a tiny one. Anyway, here is the finished item for my daughter, who is enduring a very cold winter. It has a slouchy shape as she has long hair and likes to bunch it all up underneath. She also likes these whimsical styles. It’s probably going to look better on her head than on the soccer ball I’ve used as a proxy for a hat mould! 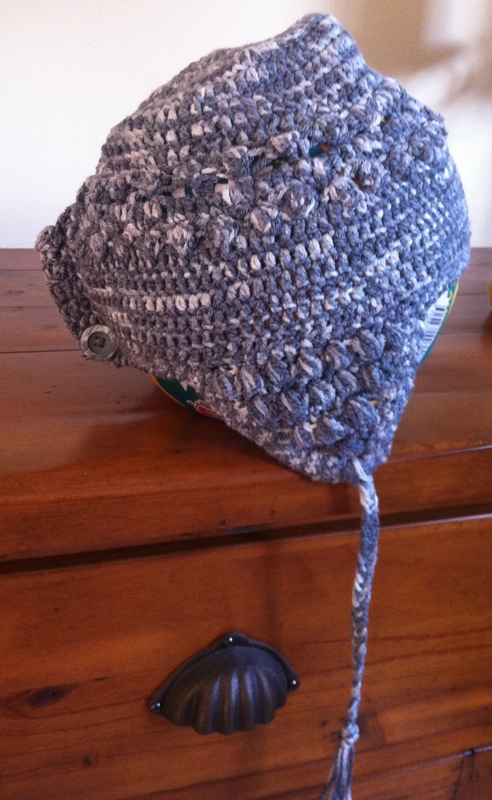 This entry was posted in Clothing, Design, freeform crocheting. Bookmark the permalink. Gorgeous hat – just in time!